Quiche! it’s a bit of a divider, some love it, some hate it. I love it but – as if anyone is surprised – I’m particular about it. 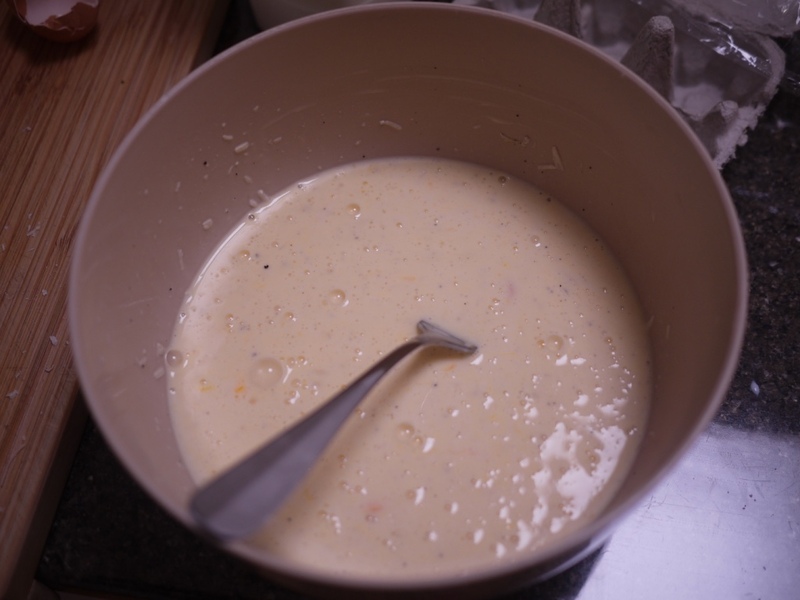 The egg mixture can’t be thinned with just cream, it’s gross, the mouthfeel is too fatty, and all you can taste is cream – I like about 1/3 cream 2/3 milk, but each to their own I suppose. The big one for me though is that you can’t eat it hot. Just warm is best, fridge cold is fine, but hot – nup, nup, nup. I make the pastry, a dead simple olive oil one, but if you want to use a frozen one go for it. 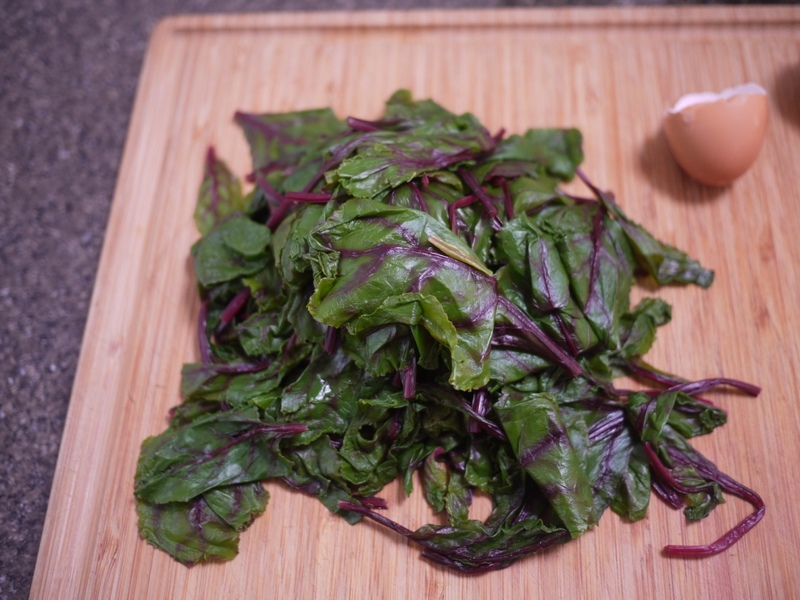 Note: I used the leaves from three bunches of baby beetroots as the leafy greens here but as there’s no reason that you would just have that sitting around in your fridge feel free to substitute silverbeet (leaves only) or whatever your go to leafy green is. I also just had two egg whites sitting around that needed to be used, if you haven’t, just use five eggs instead of four. a good grating of parmesan – 30g ish? 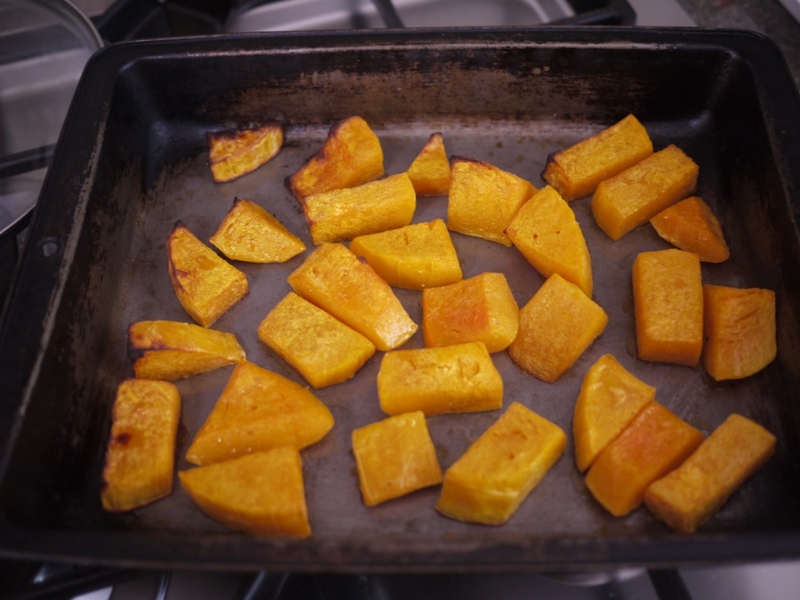 First off – Peel the pumpkin and chop into good, 3cm sized chunks, chuck on a tray and toss in a little olive oil and salt. Whack it in the oven at 180° and cook until soft and starting to caramelise. Make the pastry – Put the flour and salt in a bowl and add the oil. Using a fork, mix together until the oil is all mixed in and it looks a bit like you’ve got a bowlful of oily pebbles. continue mixing and slowly add the water, a little at a time, until it comes together enough to form into a dough. Tip it onto a lightly floured bench, kneed it a little and form it into a round flat disk. It will have a mottled, marbled pattern and be fairly crumbly, but not too bad. 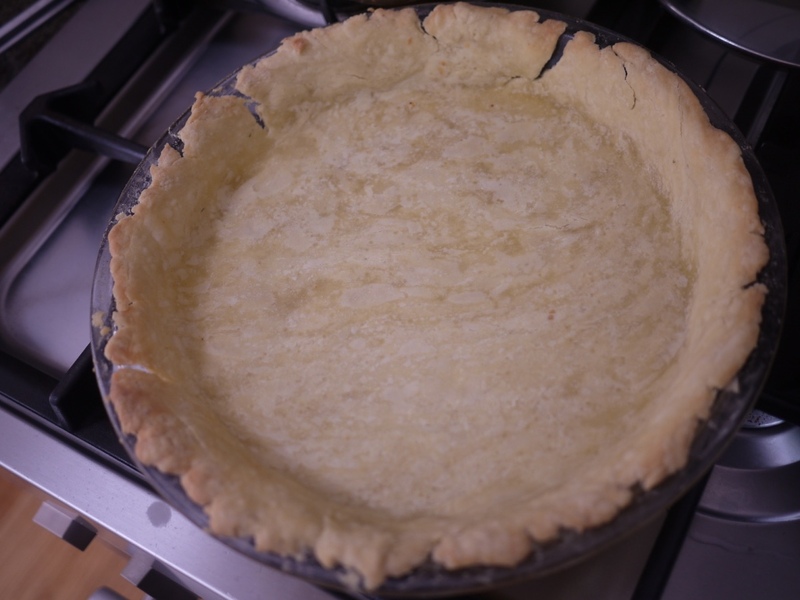 Grease your pie dish/quiche tin/what-have-you, flour it if it’s particularly prone to sticking. Roll out the dough (this might require some fairly liberal flouring of pastry and pin) and press it into the dish, patching any cracks with the overhanging dough. Pop it in the fridge for a while – 20 minutes or so is fine. (Use your 20 minutes here to do more filling prep, obviously.) Take it out of the fridge, cover with baking paper, then cover the paper with dry beans or rice or whatever you use for blind baking. Throw it in the oven (check the pumpkin, pull it out if it’s done) and bake for 15/2o minutes – until, when you pull the paper back, the bottom doesn’t look raw. Turn the oven down to about 170°. You can see this is a little cracked, I was using a different shaped and sized dish than normal as I’m at my parents’ house – I plugged the cracks by squishing a pumpkin chunk in each one. Worked a treat. The rest of the prep – Boil a big pot of water. Put a big bowl of cold water nearby or in the sink. 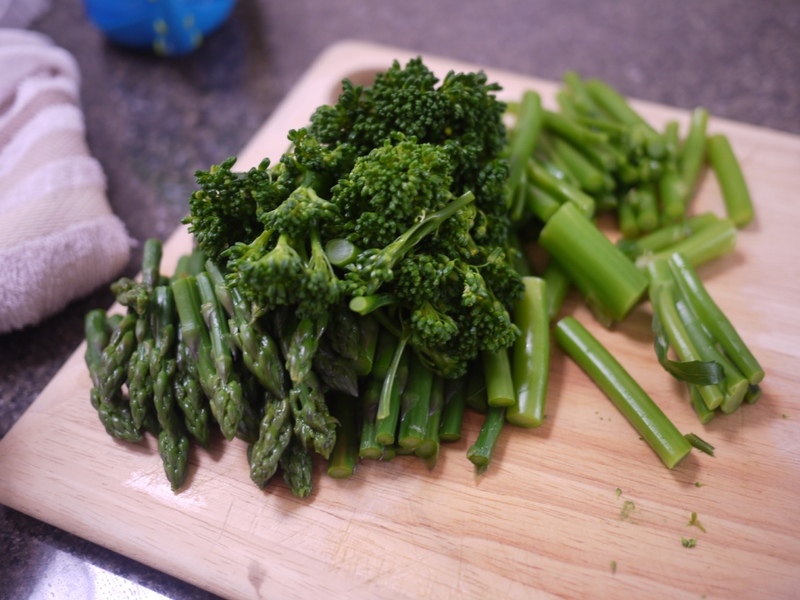 Blanch the vegetables – put the broccolini in first, cook for one minute then put the asparagus in with the broccolini and cook for a further two minutes. Fish them out and put them in the cold water to stop them cooking and to somewhat preserve their GREEN! colour. Pull them out of the water and let them drain on a clean tea towel or some paper towel. Throw the beetroot leaves into the boiling water, allow to come back to the boil, then cook for two or three minutes. Drain and put the leaves in the cold water. Squeeze as much water out of the leaves as you can and pat dry with paper towel or a clean tea towel. Mix together the eggs, cream, milk, salt and pepper, and parmesan. 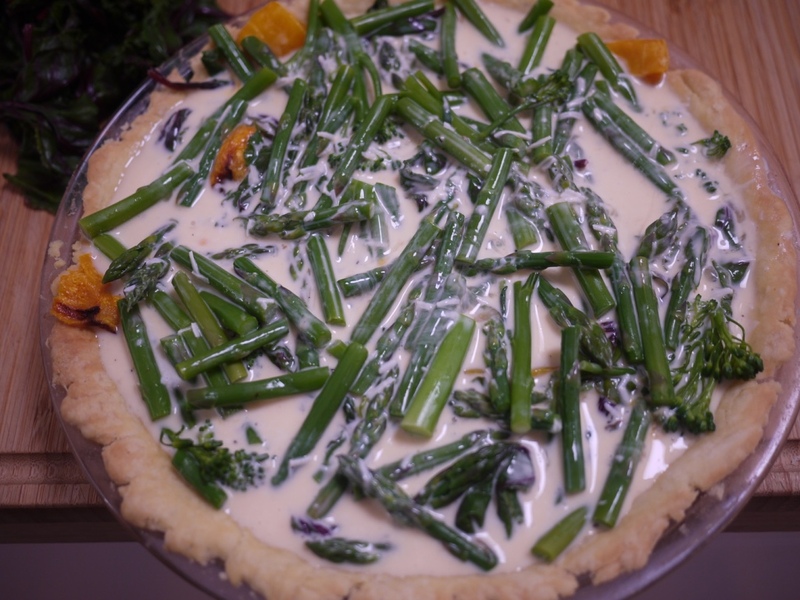 Arrange the vegetables to your liking on the bottom of the pastry case then slowly and carefully pour the egg mixture over the top, filling any gaps. Bake at 170° for about 40 minutes, or until it is just set in the middle. Remove from the oven and allow to cool until just warm. We ate this with a really good salad made from very nice Black Russian tomatoes, red onion, balsamic vinegar, salt, pepper, olive oil. 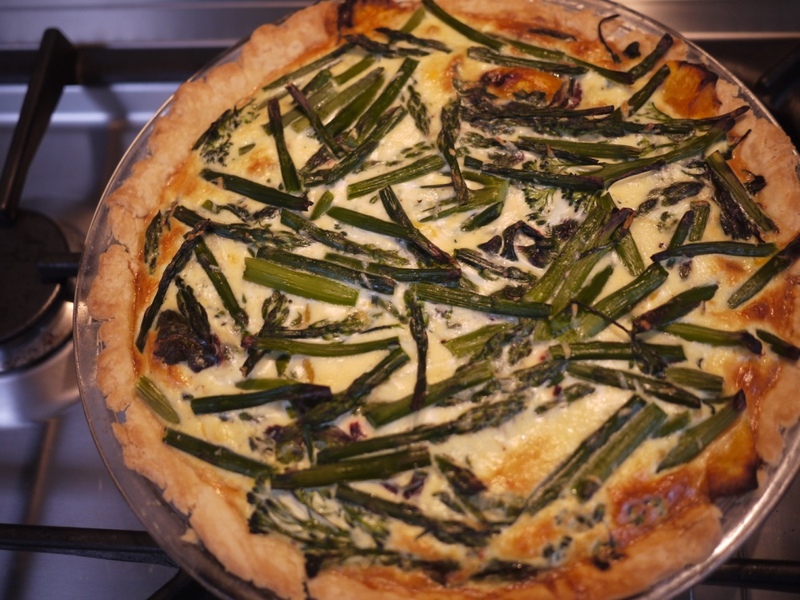 If you happened to have some goat’s cheese in the fridge, a good few dollops here and there in the quiche certainly wouldn’t go astray.